Doctor Booker MacLean is shocked when his estranged wife calls and asks to talk to him in person. Is Sybil back to finally ask for a divorce? Three days before Christmas? He hardens himself for the blow that’s sure to come. Sybil MacLean has been gone from MacLean Mountain and from her husband for seven long months, and now she’s back to admit that leaving was a terrible mistake. She has a secret, but won’t share it with Booker unless he forgives her and takes her back first. As a powerful blizzard moves into the Colorado Rockies and Sybil and Booker are stranded together atop MacLean Mountain, will his fierce pride and her need for his understanding keep them from spending Christmas with the one they love most? Booker MacLean drove his black pickup truck across a pristine inch of snow in the parking lot of the Steamboat Springs Diner. The snow had slowed to just a few stray flakes, but was due to pick up again sometime tonight and hit them hard for at least three days, which put the storm well into Christmas. Multi-colored strings of lights surrounded each of the diner’s windows, and shone into the darkness as he pulled into to a parking spot and cut the engine. Only one other car sat in the lot, and it was covered with snow. It must be hers. How long had she been here? Reaching for his hat, he spotted a small, dark-haired figure huddled in a booth by a window, staring out at him. It had to be Sybil. His wife. His heart nearly beat out through his chest, reminding him how much he loved her, how much he’d missed her, and how much she’d hurt him when she’d left. “Get this over with.” Booker shoved his heavy black cowboy hat onto his head and opened the truck door. A cold blast of air hit him, like a forecast of what Sybil was about to tell him. It would probably be the worst news he’d heard in his life, and his footsteps hit heavily as he trudged toward the building. He pulled open the glass door of the diner and an electronic doorbell gave a quick, off-key rendition of Jingle Bells. Staring straight ahead for a few seconds, he regained his emotional footing. 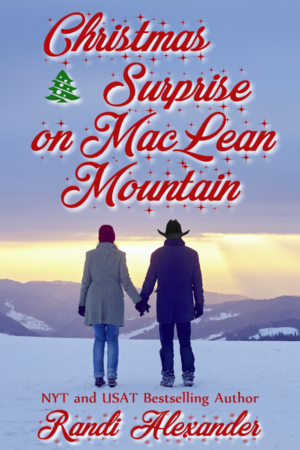 He pulled off his cowboy hat and stomped on the entry rug to shake the snow from his boots. “Hey, Doc.” Brenna, the owner, came from the kitchen, her red hair pulled up in a bun, her pretty face—usually smiling in welcome—frowning in understanding. She glanced to where the only other occupant of the building sat in a booth. He had to do this. No changing course now. Nodding to Brenna, he turned and saw her. Sybil. Her long, straight brown hair flowed softly over the shoulders of her thick red sweater. The knit scarf he’d given her last Christmas dangled from her neck. She gripped the ends tight in two fists, the reds, greens, and golds a reminder of how he’d been preparing himself to spend this Christmas without her. Or more accurately, ignoring Christmas all alone. A huge tote bag leaned against her side, and a puffy lime-green coat filled up the other side of her bench. Evidently she didn’t want him to snuggle in next to her, the way they used to do. With a long exhale, he finally looked at her face. Huge brown eyes that, right now, resembled a rabbit startled by a coyote. His wife, who he hadn’t seen in seven months, and hadn’t expected to see again. Ever. Swallowing emotion, he strolled toward her. To give himself a moment, he carefully hung up his shearling-lined coat and black hat before he slid onto the bench across from her. His chest clenched. Here it comes. She would ask for a divorce. One her father had surely talked her into. Had she found someone else? That thought made him a little crazy. Someone else touching her, loving her, falling deeply for her sweet personality and quiet poise. Someone who’d even love the spark of temper she showed on occasion. But then, didn’t she deserve a man who didn’t work long hours? Didn’t leave her alone at a remote ranch high up in the Rockies, sometimes overnight, sometimes for more than 24 hours at a time? “Just coffee and pie. Pumpkin, if you’ve got it.” When the shocking phone call had come from Sybil at dinnertime two hours ago, he’d been about to heat up leftovers. Instead, as his thoughts pinged wildly in his head, he’d thrown together a couple sandwiches for the drive down the mountain. Now, the bread, cheese, and meat sat like a bowling ball in his stomach. “Anything else, Ms. Sybil?” Brenna sounded worried, a little whiny. “No, thank you.” His wife smiled at the woman she used to call a friend. “You’ve been here in the diner for two hours?” He hefted a breath. That was one of the downsides to living on a Colorado mountaintop. “I’m sorry, Syb. With the snow and all…” He shrugged one shoulder. Sybil relaxed her hands from their grip on her scarf. Booker thought she was here to ask him to make their separation permanent? She could never do that. She loved this man, more than life itself. She’d been so wrong to leave him. He was a very proud man, and she’d insulted him horribly. It had taken months of inner turmoil for her to realize just how much she loved him, and how meaningless her life was without him. She had to find a way to convince him to take her back, though, and that would not be easy. If she didn’t find a way, she’d be lost. Especially with the new development in their lives. She touched her swollen stomach which she’d intentionally kept hidden under the table. Beneath her palm, their baby shifted. For the sake of their family, she had to gain his forgiveness. “I got your phone calls, Booker. Your messages.” Her husband had called every week, every Tuesday night at eight, the one night of the week they had always been together, no matter what. And if he’d been forced to be away from home, delivering a baby or accompanying someone to the hospital, he still tried to call, even if it was just to leave a ten-second message. “But you never returned them.” He stared at her, no emotion showing in his gray eyes. “I kept them, every one of them, and I listened to them.” She thought about reaching for her purse and pulling out her phone to prove it, but she didn’t have to prove anything to him. He trusted her implicitly, which was the opposite of what she’d given him. She’d doubted and distrusted and believed mean little stories told to her by well-meaning neighbors. She wrapped her cold hands around her cup. “I didn’t know what I was doing. I felt so lost.” When she’d run back to her father’s alpaca ranch in Southern California, she’d let Papa console her. He’d reminded her that he was the only man she could rely on, and reiterated how, just like her mother, people were untrustworthy, unfaithful cheats. Thankfully, when her husband’s calls kept coming in every week, she began to doubt her father’s words…and her own judgment. Booker’s pie and coffee came. He stared at the big slice for a few seconds, then jammed his hand through his curly black hair. “Why are you here?” He looked like a man facing a death sentence. He sat back, staring at her. She closed her eyes. That night, seven months ago, Sybil had smelled his married intern’s perfume on his shirt, and he’d given her the excuse that Larissa had come on to him, but he’d shoved her away with a firm warning. “Was this the first time?” Sybil had asked him. “No, she’s been flirting, but I’ve tried to be professional with her, direct but not harsh. I didn’t want it to ruin our working relationship, but I guess I was too subtle for her.” Booker had shrugged and walked away, as if that was the end of the conversation. He stared at her hand, a muscle in his jaw working. He was angry. She held back her grief. She’d never meant to hurt him, she’d just thought leaving would show him she would not tolerate his behavior any longer. These last seven months, she’d missed him so much that it had paralyzed her with indecision. “I hoped you would come back.” He slid to the outer edge of the bench. “And I prayed that you’d realize you were wrong to doubt me.” Standing, he took his hat from the hook. This couldn’t be happening. “You’re walking away from me?” Her voice squeaked to a whisper. He pulled out his wallet and set a large bill on the table, then took his time putting his wallet back in his jeans. “I’m a proud man, Sybil.” He buttoned his coat, as if placing a barricade between her and his heart. “When you doubted me this spring, it nearly killed me. I don’t want to risk that again. Your needing verification of my honesty?” He dropped his head “That’s not the kind of love I can live with.” He turned and started for the door. “Wait, Booker.” Her voice echoed in the silent room. He stopped but didn’t turn around. Should she tell him about the baby? Just blurt it out? It was his right to know that he would be a father soon. But then, would he take her back only because she carried his child? Could she live with that kind of love? She waited, straining to hear his response. He continued his slow march to the door and shoved it open. Snow blew into the restaurant as her husband walked out. Dropping her head into her hands, she let her scarf, the one he’d given her last Christmas, soak up her tears. Booker started his truck and ran the wipers to clear the light snow that had settled on the windshield. He spotted his wife in the diner. She’d slumped over and was most likely crying. Brenna ran over to her, pushed her way onto the bench next to her, and hugged her. He wanted to hug her, to chase away all her tears, make a new start, but he couldn’t chance feeling the joy of loving her again, only to be beaten down by despair and left alone once more the minute she heard another rumor about him. The women sat together in a huddle, then Brenna stood and started to walk away, Sybil reached out and grasped her wrist, stopping her. Brenna made angry gestures, pointing to his truck. What was that about? Was the restaurant owner going to come out here and give him hell? He deserved it. He backed away from the building and drove out of the lot. At the corner, he turned and headed down the street behind the businesses, cut his lights, and pulled into the vacant lot next to the diner. He may not want her back in his life, may not want to risk loving her again, but he wanted her safe. Something he’d never stopped doing. He’d kept track of Sybil by calling her father every few weeks. Each time, the man had grudgingly told Booker she was fine, to stop calling, then would hang up on him. Tonight, Booker would follow her to wherever she was going and make sure she arrived safely. Fifteen agonizing minutes went by as he debated whether to change his mind, storm inside and scoop her up, haul her up the mountain with him, and beg her forgiveness for his damn stubborn pride. But like a bad sweet craving, with time and effort, it went away. After a half hour, heavier bands of snow swept through, making her solitary figure by the window appear and disappear. Each time his wipers swept away the falling snow, it startled him out of his memories. Sybil, so young and beautiful, riding her horse on their land, taking over the bookkeeping for his practice, giving up her own professional goals of working in hospital administration so she could help him. Maybe what her father told her was true; she was too young for Booker. Was she too young to know how to handle the situation with Larissa? Or had Booker handled it poorly, assuming his wife knew he’d never be unfaithful to her? An hour later, she still hadn’t left the diner. What was she waiting for? The real storm wasn’t going to hit for a few hours, then they were in for a big one. She didn’t plan to spend the night in the restaurant, did she? Not when there was a motel with a Vacancy sign just a block away. The stress of watching her, knowing he was just seconds away if he changed his mind, nearly drove him crazy. His mind wouldn’t change, even though his heart told him it should. He wasn’t a hard man, but he’d been brought up to be proud and strong; taught to never back down, never give an inch from what he knew was right. “Damn.” He’d let his temper fuel his pride. Now, after cooling down, things were looking different. He’d overreacted. That was Sybil sitting there. The woman he loved. Headlights on a big vehicle rolled along the highway and turned into the diner’s lot. The Greyhound Bus pulled up by the door. Three people stepped out of the vehicle, then a few minutes later, the driver followed, shuffling into the restaurant. Booker would wait for them to leave, then he’d maybe wander into the diner. Maybe? When had he ever made a plan using the word maybe? She had him so turned around, he’d likely stammer and trip over his own feet in the diner. Brenna served them and within twenty minutes, the four travelers left the building and packed back onto the bus. Then the diner’s door opened. “Oh God.” The world went a little wobbly. His mind couldn’t comprehend what he was seeing. Pregnant? That couldn’t be his wife. Seven months since he’d seen her…surrounded herself with her bags and her coat…hiding it from him. “Oh God.” He turned on his headlights as the driver stepped off the bus to help Sybil up into the vehicle. Booker only knew he had to keep the bus from leaving. Hitting the accelerator too hard, he skidded forward, his truck nearly doing a full-circle before he let his foot off the gas and pulled directly in front of the bus. He jumped out, sliding on the slick pavement in his race to get to the vehicle. Sybil’s face appeared in the window of the door, pale and wide-eyed. She spoke to driver, who opened the door, and she stood, holding her bag in front of her, as if to hide the evidence. Sybil stared, her mouth open, her breath coming fast. “Ma’am?” The driver had his phone in hand. “It’s fine.” She grasped the railing and stepped down. “I’m in no danger from him.” With Booker’s help, she reached the lot. He tucked her securely under his arm, baby-stepping her to the truck, then settling her in the passenger seat and opening the back door, setting down her bags. When he was behind the wheel, he moved his truck from in front of the bus, stopped beside the diner, and shifted into park.